A while back, I asked a cycling-obsessed friend for a pannier recommendation and the response was instantaneous and automatic. “Ortlieb,” he said. After some more research I came to understand why. Ortliebs have a peerless reputation for quality and durability. But, above all, they have a reputation for being utterly watertight. And that’s precisely what makes them useless for me. We’re not planning on doing any touring or other forms of cycling where you need ‘luggage’ – that is, I’m not going to be carrying clothes or other rain-sensitive items from point-to-point. I’m not going to be camping. Ever. Nor do I intend to wade my bike through the rivers of the Himalaya. To carry a standard kit of tools, rain cape and spares. To haul any food & drink we might want for an outing. To function as a camera bag. Pretty much any pannier would work for the first two. It was the third that has guided my choice. It’s important to be able to get into the bag quickly and easily so that I can grab the camera when a shot presents itself. And while I’m thinking about getting a front pannier for this purpose, I’m still experimenting with handlebar/stem options, and until that’s sorted I’ll be working with rear panniers. 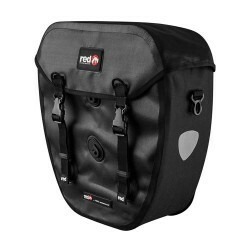 The roll-top style adopted by the classic Ortlieb Packer design is clearly a non-starter as a camera bag. It’s great if you want to pack your stuff in the morning and retrieve it when arriving at your destination. But it’s hopelessly clumsy when you need frequent and fast access to the contents. I was half-tempted by the Ortlieb Sport Packer. But from what I could see from photos, even that looked like it was going to be a bit of a pain with its double drawstrings. So my first attempt was something simple – the Red Cycling Products (RCP) WP100. This turned out to be a mistake, but not a disaster. The bags are big – 20 litres each. There’s not much sophistication to the design – you get one main compartment and that’s it – no inner or outer pockets. 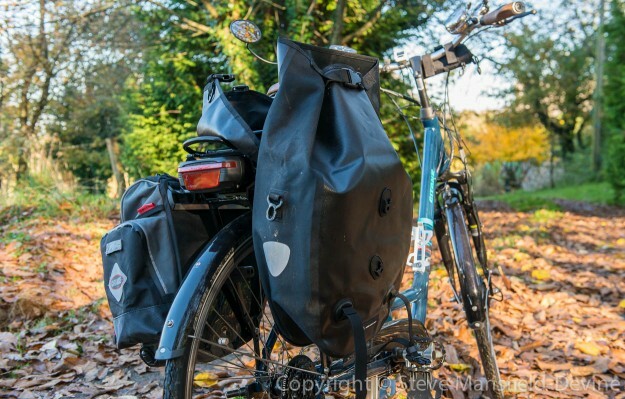 The panniers are made of heavily waterproofed tarpaulin, so each weighs in at over a kilogram. The voluminous nature of the bags means they can take my Nikon D800 and 24-70mm f2.8 zoom lens – a pretty hefty piece of kit – with room to spare. Perhaps too much room. The lid closes with two quick-release buckles, which is the feature that drew me to them. What none of the pictures I’d seen showed, however, is that under the lid is a fold-down flap with its own quick-release buckle to cinch the flap shut. This is a major pain and not dissimilar to the roll-top idea I was trying to avoid. Even if you ignore the inner buckle, closing the pannier takes precious unnecessary seconds because the flap has to be folded just right. Doing this two or three times on a trip wouldn’t be bad. Doing it more often than that would be annoying. It does, however, make the bag very waterproof (Red claims 100% waterproof) if that’s important to you. The bag clips to the rack with two fast-release catches and there’s a very adaptable peg that goes behind the rack stays to stabilise the bag when you lean. Our racks have unusually shaped and somewhat thick bars, but there was no problem getting these bags to fit. 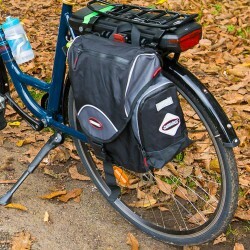 The panniers also have rings to allow you to attach a shoulder strap (not supplied). I found I could also clip a rear light to these rings. The bags are symmetrically designed, so it doesn’t matter which side of the bike each goes. The RCP (on the right) is fully watertight when closed. Overall, these panniers are very well made and robust. At €59 for a pair, they are also inexpensive. While I decided they don’t meet my requirements as a camera bag, I chose to keep them for other purposes. For example, Trish recently used them to carry a large quantity of apples from our orchard to a friend’s house – and returned with the bags stuffed full of grapes. Cleaning them out afterwards was very easy, partly because of the waterproof material and partly because of the simplicity of the design. 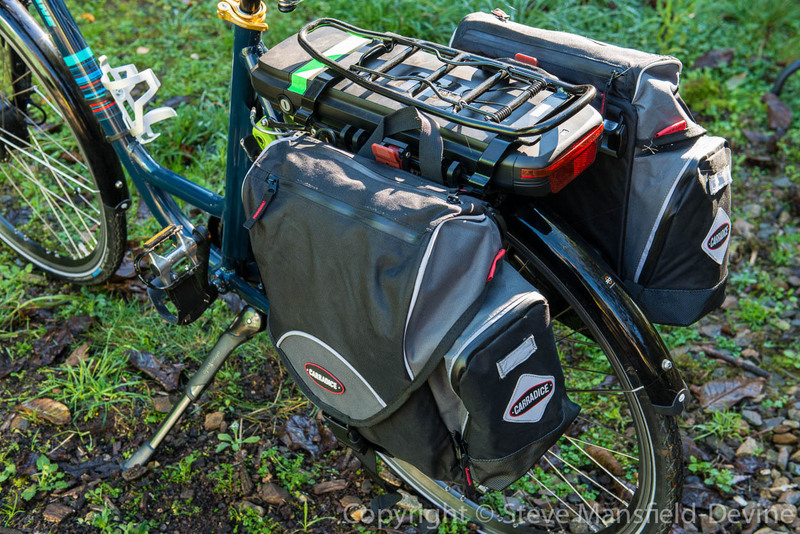 So I’m now thinking of these panniers as our cycling equivalent of a pick-up truck. So, take two. I’d been eyeing up Carradice kit for a while. On forums, the Carradice/Ortlieb debate seems to have something of the flavour of the Mac/PC or iPhone/Android wars – which means that much of what you read is too ideologically biased to be of much use. The Carradice Carraduras – very smart. Carradice has a good reputation, though, and the Carradura design actually put me in mind of classic camera bags, such as the Billingham. Both have that hand-crafted, ‘built by people who use them’ ethos. With the Carradice Carradura rear panniers, a single quick-release clip opens the top flap to give access to the main compartment – so that’s even better than with the RCPs. That compartment swallows my camera/zoom plus an additional telephoto lens. Outside the bag, there’s a rear zipped pocket and a front mesh pocket, both quite capacious. Inside the main compartment is a flap with one zipped pocket (I put a tyre repair kit, CO2 canister, lens pen and lens cloth in there with room to spare) and three mesh compartments. The Carraduras have an inner drawstring sleeve, for watertightness. But this is easy to tuck down inside and ignore. On the top of the bag are two zips. One provides access to a very large pocket – comprising most of the area of the top flap – which is ideal for stuff you need to get to fast. The other houses an elasticated, hi-vis yellow rain cover. This is attached to the bag with a piece of elastic, so there are no worries about the cover coming off and being lost as you pedal. 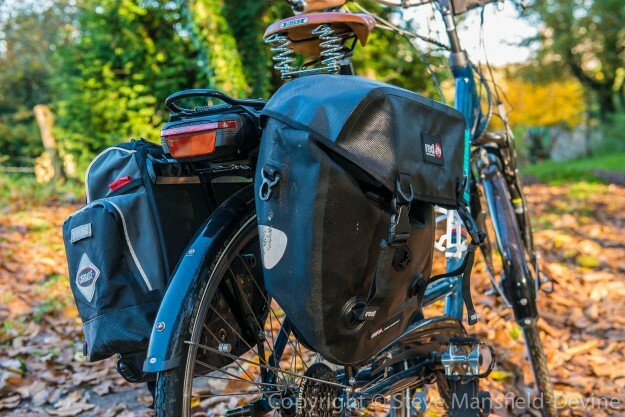 I read a comment on one forum that criticised the Carradura panniers precisely because of this rain cover. The argument went that ‘having to add’ a rain cover in this way is an inherent design flaw. This is misguided because it fails to acknowledge that all products are designed with certain priorities. 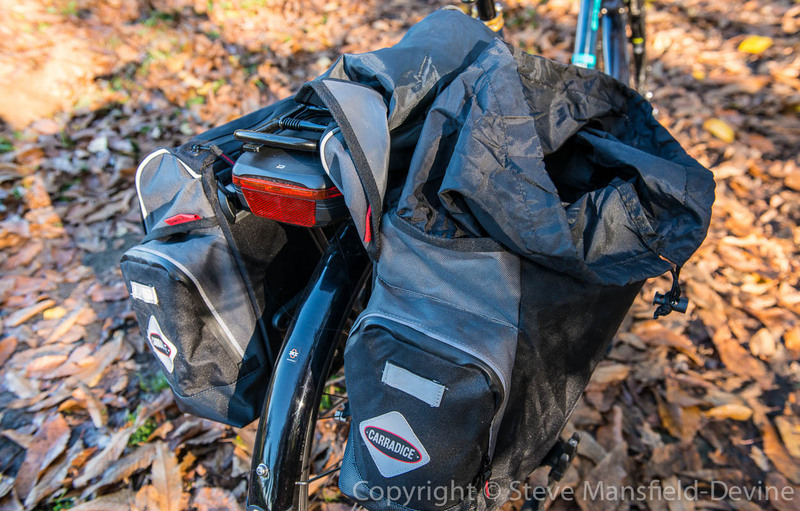 With the RCP panniers (and the Ortliebs) being waterproof trumps every other consideration. And that’s fine so long as it’s also the highest priority of the user, too. For me, it makes them unusable because the dedication to water resistance gets in the way of practicality. The top pocket is quite capacious. Instead of this rain hood, it would easily swallow a couple of maps, and more. The Carradice Carradura panniers, on the other hand, emphasise ease of access and, with all the pockets, the ability to arrange things as you need them, so you’re not constantly riffling through the main compartment hunting for some small item. The vast majority of the time, I won’t be cycling in the rain, so all that waterproofing on the Ortliebs and RCPs would be wasted, and the compromises enforced by it actually reduce the usefulness of the panniers. With the Carraduras, I can choose (via the rain cover) when to have them waterproof. To be honest, the rain would have to be torrential before I would consider using the covers. The bags are pretty waterproof without them. All the external zips are the rubber sealed type. The main cover overlaps the body of the bag well. And the main compartment does have a drawstring sleeve. (I leave this open and tucked down into the bag. It does get in the way of the inner pockets somewhat, so I’ve even contemplated cutting off this sleeve.) 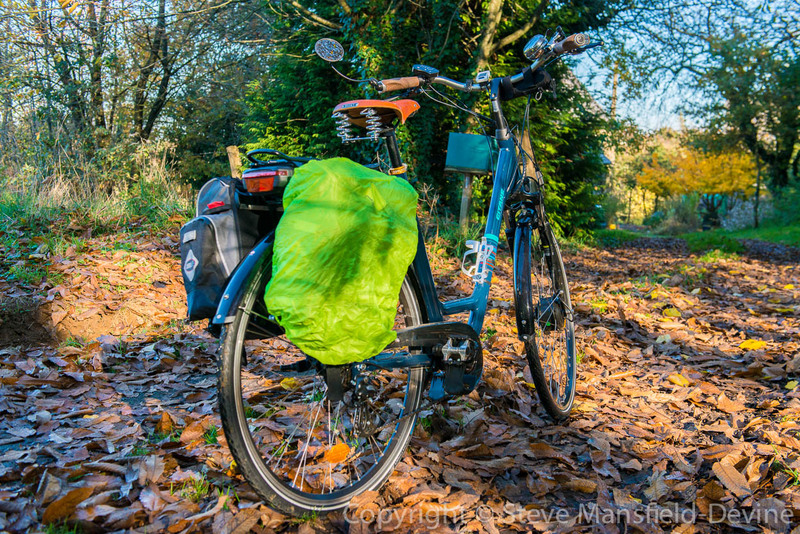 I haven’t yet cycled in the rain, but feel confident in the panniers’ ability to stand up to quite a lot of water – an impression that is supported by many comments I’ve read online. Attachment is via two hooks plus a central clip – the latter going under the rack bar. It doesn’t have the simplicity and speed of the ‘one tug and you’re done’ Ortlieb system (you know – the system that makes it easy for people to steal your pannier while you’re paused at traffic lights). That’s not important to me; typically, the bag will be mounted and dismounted once per trip – possibly twice if we stop for a picnic. The hooks come with 8mm and 11mm adapters, but because of the thick bars on our racks I found they work best with no adapters. Once clipped on, there’s no rattling or signs of movement – the bag is entirely secure. Again, the peg is adaptable (though not to the same extent as the RCP panniers). Mounting and dismounting are quick and easy. The Carraduras are supplied with shoulder straps, and on the rearward-facing panel is a strap to which you can clip a light. One note of warning: I was expecting the bags to be a kind of dark brown and grey colour. In fact, they are black and grey (albeit with enough high-vis detailing to make them show up well in headlights). Having looked again at Carradice’s website, they seem to have photographed the products in tungsten lighting, giving everything a warm, amber tone, so the pictures are somewhat misleading. At first, I was disappointed, but once I got over the surprise I came to like the smart appearance of the bags. 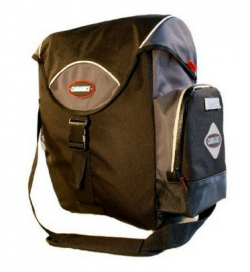 At £60 for the pair, the Carradura panniers are great value. (And Carradice charged only £12 to ship them to France.) They are beautifully made – again, recalling my beloved Billingham bags – and very well thought-out. As camera bags they function very well. 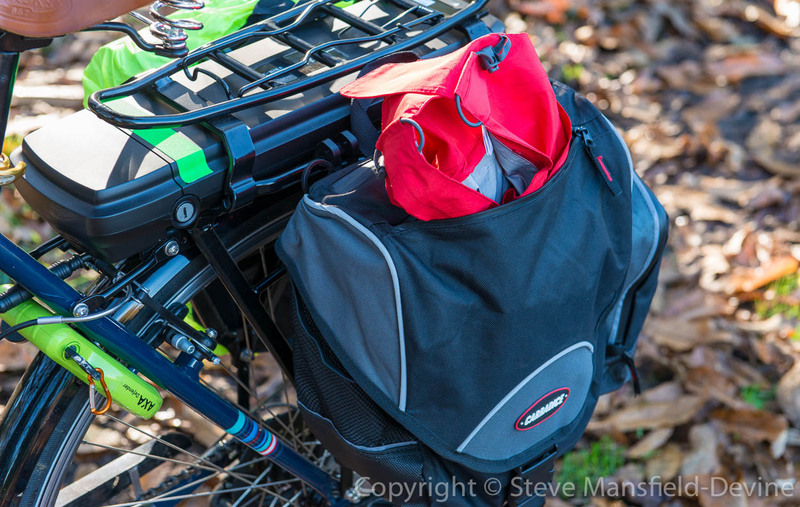 I now have one pannier filled with my standard cycling kit (tools, spares etc) and one as the camera kit (including spare batteries and SD cards, lens cleaning stuff, etc), which makes getting ready for rides very quick. The Carradice look nicer in black anyway – I wasn’t looking forward to your ‘khaki’ panniers!